Jeannie considers herself a mixed media fiber artist who reproduces representational and interpretive images from her photographs and drawings. Exploring new techniques and materials on a variety of surfaces also define her work. Creating a painterly style with the addition of texture with fabric, paints, dyes, screens and stitch is what she loves to do. Jeannie loves a challenge, which sometimes requires dyeing and printing some of the fabrics to get exactly the piece needed. 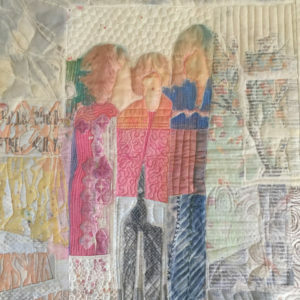 At the moment Jeanne has four quilts traveling and being exhibited throughout the world with SAQA (Studio Art Quilt Associates). For the past four years she has had quilts juried into the World of Beauty Exhibition at the International Quilt Festival in Houston. Also at Houston she has exhibited with the Dinner@8 group. 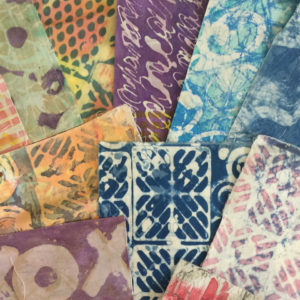 Visions Art Museum presented a To Dye For exhibit in 2016 of which she was one of five artists. She has had numerous articles published in Quilting Arts Magazine and has a Mixed Media Art Quilt DVD with F&W Publishing.